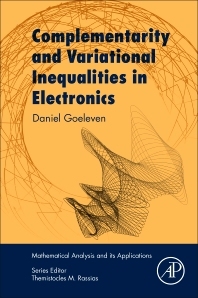 Complementarity and Variational Inequalities in Electronics evaluates the main mathematical models relevant to the study of electrical network problems involving devices. The book focuses on complementarity problems, variational inequalities and non-regular dynamical systems which are well-known for their applications in mechanics and economics, but rarely target electrical applications. The book uses these tools to review the qualitative properties of devices, including slicers, amplitude selectors, sampling gates, operational amplifiers, and four-diode bridge full-wave rectifiers. Users will find demonstrations on how to compute optimized output signal relevant to potentially superior applications. In addition, the book describes how to determine the stationary points of dynamical circuits and to determine the corresponding Lyapunov stability and attractivity properties, topics of major importance for further dynamical analysis and control. Hemivariational inequalities are also covered in some depth relevant to application in thyristor devices. Daniel Goeleven graduated in applied mathematical engineering, Facultes polytechniques, Universie Catholique de Louvain, UCL, Belgium, in 1989 and received the Ph. D degree in mathematics from the Facultes Universitaires de Namur, Belgium, in 1993. He was an FNRS researcher for two years and he held an Alexander von Humboldt postdoctoral fellowship at the RWTH Aachen, Germany in 1996. Since that time, he has been a Professor at the University of la Reunion, France. His major scientific interest concerns variation inequalities modelling and (possibly non-smooth) dynamical systems modelling with applications in different areas like unilateral mechanics, non-regular electronics, biology and biochemistry.